UPDATE: 10/4/2017 Festus was able to get his diagnostic test done – fingers crossed for good results. 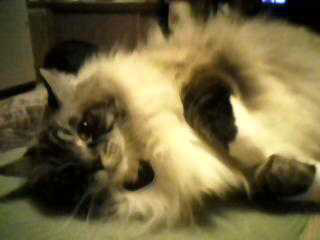 My 16 year old Ragdoll cat (that I purchased when he was 3 months old) was diagnosed with hyperthyroidism a few months ago. working 32 hours per week. I am single and live alone with my fur baby. I am really just starting to get back on my feet. I cannot afford to make any payments to Care Credit at this time. Festus has been my salvation through thick and thin. He has always received timely veterinary care and vaccines. I love him with all my heart, and I know he loves me back! The daily medication he takes for hyperthyroidism is fairly inexpensive, it is the blood work to check his thyroid levels that I am struggling with. Please help me see that he gets the proper care that he so deserves!